Time for another look at the latest developments with Firefox. This is part of our Bleeding Edge and Firefox Development Highlights series, and most examples only work in Firefox Nightly (and could be subject to change). A Font Inspector is now available in the Firefox DevTools. The HTML time element ( ) represents either time on a 24-hour clock or a precise date in the Gregorian calendar (with optional time and timezone information). This element is intended to be used presenting dates and times in a machine readable format. This can be helpful for user agents to offer any event scheduling for the user’s calendar. More information can be found in the MDN documentation for the <time> element, and in the W3C specification. The data element represents its contents, along with a machine-readable form of those contents in the value attribute. The value attribute must be present and its value must be a representation of the element’s contents in a machine-readable format. <data id="user" value="humphd">David Humphrey</data> document.getElementById("user").value; // "humphd"
It’s available in the WHATWG specification, and David Humphrey’s wrote more about it in HTML5 time and data elements in Firefox. Finally we have an alternative to invisible textareas. Really nice, there was a problem with fonts that how to check font performance and quality within the browsers and now we can inspect it and check the performance.. Instead of making font inspector, you could work on making advanced network inspector, which could push FF native tools a way closer to firebug. Well, one thing doesn’t exclude the other. 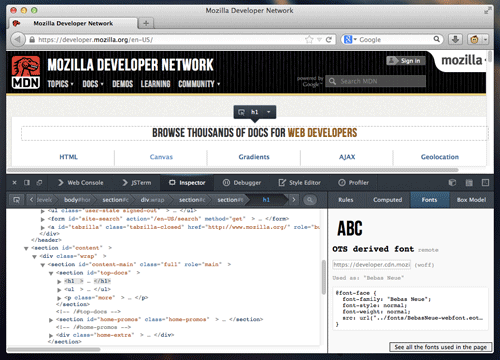 We want to do many things to the Developer Tools as good as possible.